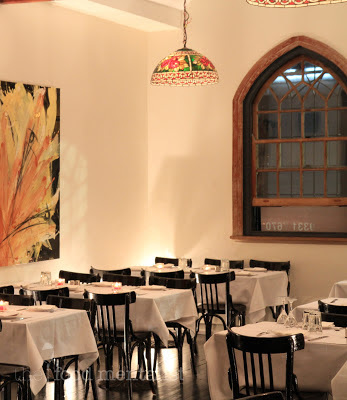 Balkan restaurant has a new home on Sydney's Crown Street in Darlinghurst. 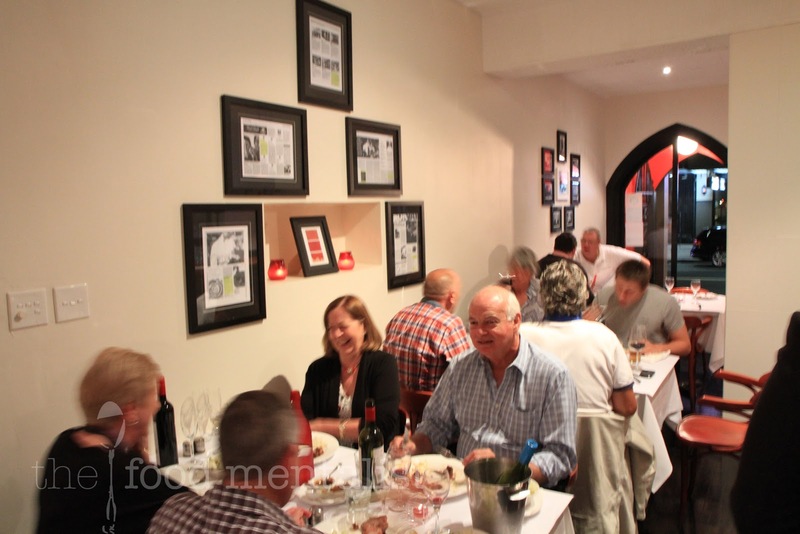 Having already established an excellent reputation for Croatian cuisine, Balkan prides itself on being Sydney's first original Balkan restaurant having served diners for the last 48 years at their previous location on Oxford Street. Specialising in Croatian dishes with a strong emphasis on fresh charcoal grilled seafood and meats, Pete and I recently had the pleasure of dining at this famed Sydney institution. To start, we notice a good selection of wines are available with many local and a few overseas varieties making an appearance, all available by the glass or bottle. We decide on a fruity Pinot Gris from Mudgee following a recommendation from our lovely waitress Sanja. We start our meal with the garlic prawn entree. 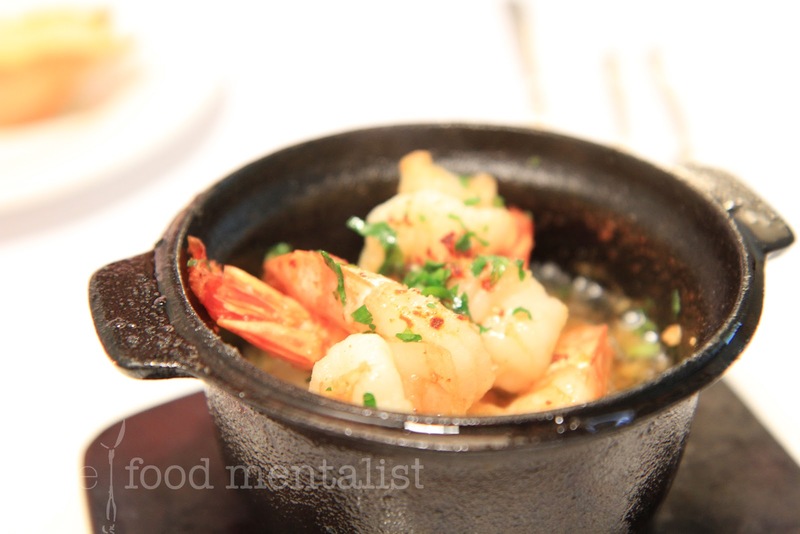 They arrive served in a mini cast iron pot, sizzling in a hot buttery garlic sauce. There are four large prawns to the serve sprinkled with fresh parsley with just a hint of chilli. They are incredibly moreish and we use some crusty garlic bread to mop up the delicious sauce. The Balkan Salad arrives and we are told that it is a traditional favourite - A combination of white potato and cabbage, it has a lovely vinaigrette, is seasoned perfectly and topped with fresh parsley. It's simple yet SO delicious and Pete and I have to stop ourselves from filling up on it before our mains arrive. 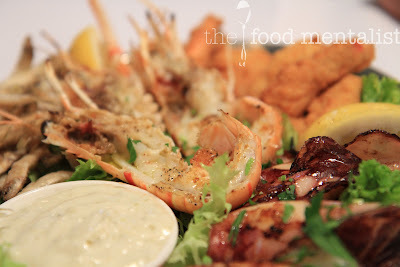 Next, we move on to the seafood platter for two which is brimming with fresh succulent grilled seafood. The seafood has been cooked over charcoal which imparts a lovely smokey flavour. 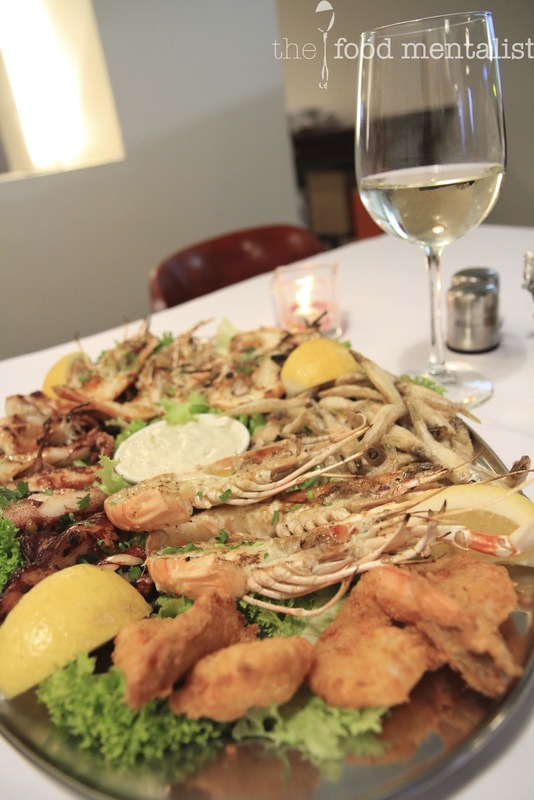 The platter is filled with generous sweet morsels of grilled scampi, baby octopus, calamari, crispy fried whitebait, and two large home made prawn cutlets. Lots of lemon and a generous portion of tartare sauce compliment the delicious seafood. 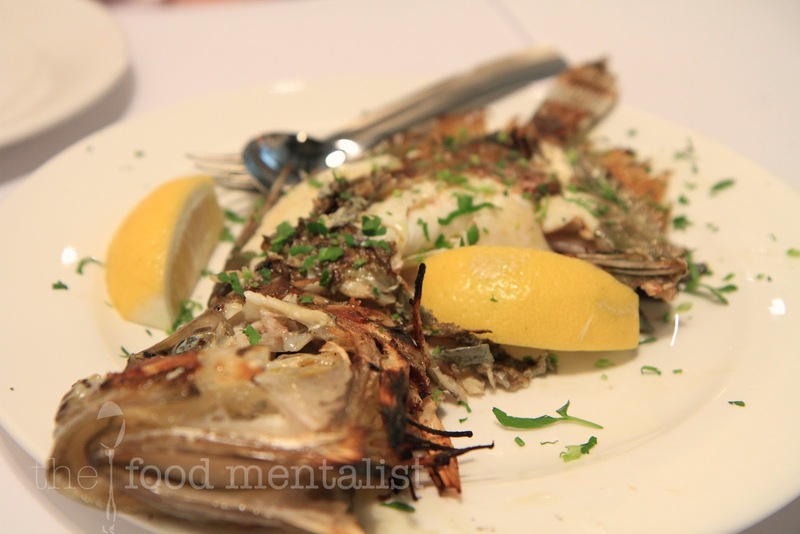 Our seafood extravaganza continues with a whole grilled John Dory which is Pete's favourite. Served with a smattering of fresh parsley and lemon, the fish just peels away from the bone and is fresh, full of flavour, and again - seasoned perfectly. I'm really loving these smokey flavours too. Hand cut chips make a nice addition to the fish - with just the right amount of salt, they remind us of home made chips we had growing up. Pola-Pola arrives next and we are told it translates to 'half-half' . 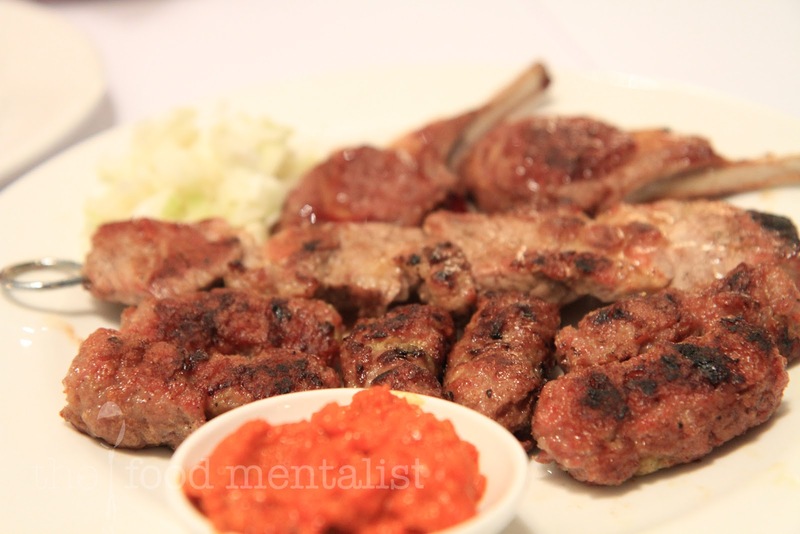 The selection includes skewered pork neck and cevapi sausages which are a skinless sausage made with a combination of seasoned beef, veal and veal mince - A meat lovers dream! The platter is served with a side of Ajvar - a traditional Baltic relish made with char grilled red bell peppers, garlic and a hint of chilli which compliments the meaty flavours. The meat is well seasoned, smokey and tender. Pete prefers the pork neck whilst my favourite are the cevapi sausages. We also try some of the lamb cutlets and they too are tender, cooked until slightly pink and seasoned nicely. By this point we are well and truly full and decide a shared dessert is the best option. There are a few dessert options available but we decide on the Croatian Pancakes as they are known as the 'house special'. Filled with fresh sweet seasonal fruit - which tonight includes kiwi, strawberries and banana, it is finished with a drizzle of pear liqueur and vanilla ice cream. 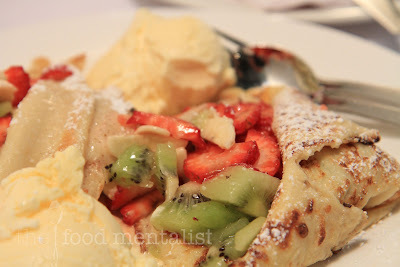 More of a crepe than a thick pancake this dessert is the perfect finish to our meal. They remind us of some of the ones we had in France - YUM! If fruit is not your thing, there are many other pancake options on offer - walnut, Croatian plum jam, Chocolate, Strawberry or plain with lemon and sugar. I can't wait to try ALL the others. 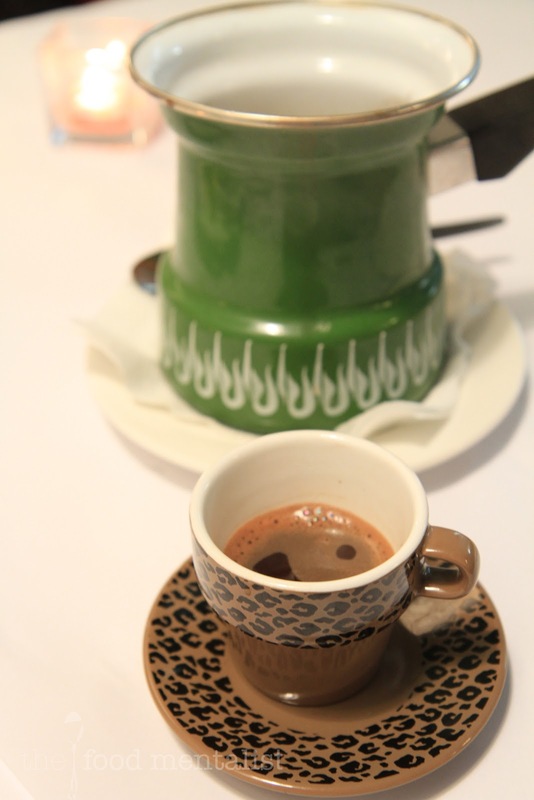 If you love coffee you must try the Croatian traditional style coffee too - it is thick, syrupy and packs a good punch. Finally, we finish on a high with a glass each of Pelinkovac (not pictured) - A Balkan digestive liqueur. It is bitter and floral and is based on wormwood. A unique drink that Sanja tells us is the perfect stomach tonic - particularly after a big meal. An upstairs dining area also doubles as a private function room for large groups and parties. 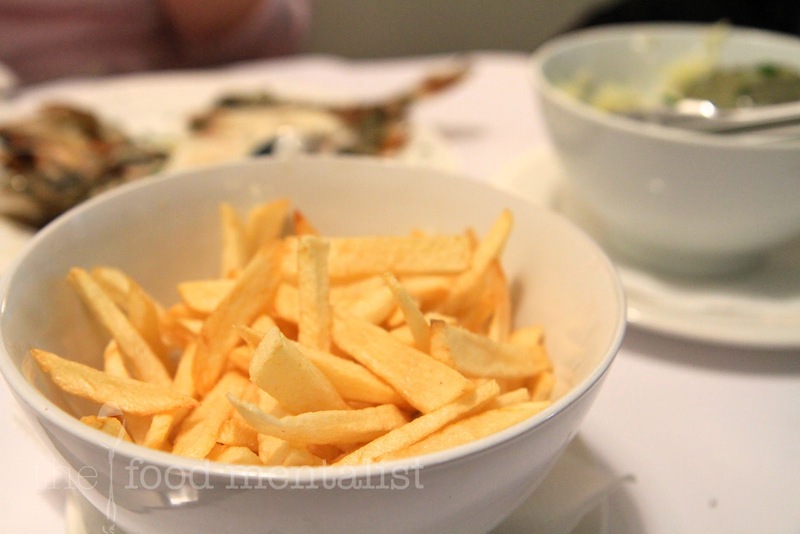 What we really loved about this restaurant in addition to the delicious fresh food, was that it offers an informality and accessibility to diners. 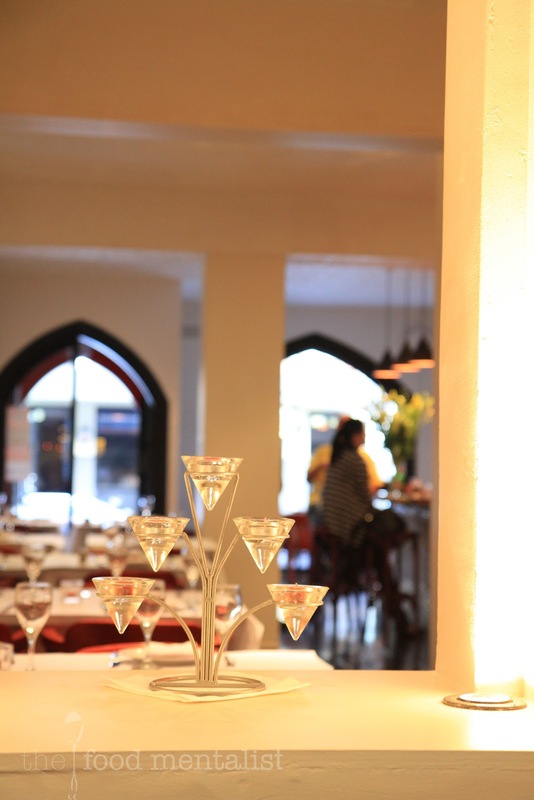 The dining experience is really complimented by the friendly and professional service and the whole space has a really welcoming homely vibe. 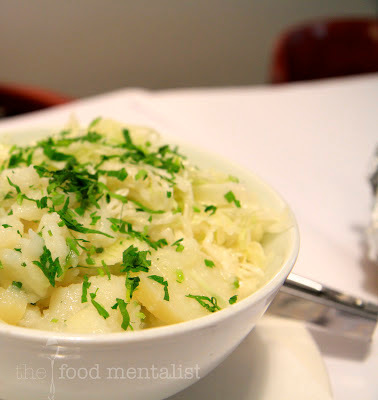 The Food Mentalist & Pete dined as guests of Balkan. great to hear about the original Balkan and it's fantastic service & menu. My husband took me on our first date there 20years ago. Will definitely go to the new premises to experience their great food & service.